The original Bomb Jack arcade game was a big hit when it was released. 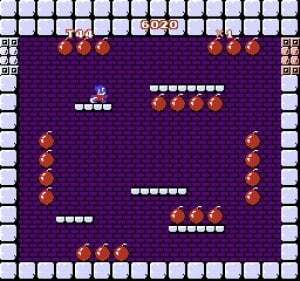 It featured a screen with 20 bombs which had to be collected in a specific order if the player was to achieve the highest score; players would play religiously in an attempt to find the best route around the baddies and to get the perfect chain. Arcade perfection! So now we come to Mighty Bomb Jack. Tecmo obviously took note of how well side-scrolling platform games such as Super Mario Bros. were doing and decided to make its own. Fair play. The results are, however, less than great. 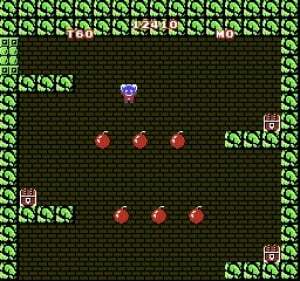 Super Mario Bros. featured tight platforming action and excellent level design, which cannot be said of this game. With the character being able to do crazy high jumps and glide, the dynamics of this platformer are somewhat broken. The baddies that you encounter, meanwhile, fly about in a almost random fashion, and the key to success is anticipating how they will move in order to get past them without losing a life; chests are also found along the way giving you power-ups. One good thing about this game is the secret rooms you can find, which adds some replayability; you often stumble across a hidden key if you search enough. No one can argue that Mighty Bomb Jack doesn't have a sense of humour, either, as you are only permitted to collect up to 9 coins per level; if you go over this limit then the message "You are greedy! Go to the torture room!" flashes up, and you are punished to jump 49 times whilst avoiding the baddies swarming around you in order to escape. Are we having fun yet? As fans of the original arcade game we had high hopes for this NES version, yet in the translation to a platform game something just seems to be missing. It will keep you entertained for a while but this game is not in the same league as NES luminaries such as Super Mario Bros.
what a shame... the arcade game is still one of my all-time favourites and i used to be qute good at it too. Happy memories! All I remember is that I played the GB version when I was very young. If that comes to the 3DS VC I will commit to a nostalgia-purchase. Well I played this game and I thought it was nice. But for 5$ is kinda high. The game is stil interesting though. 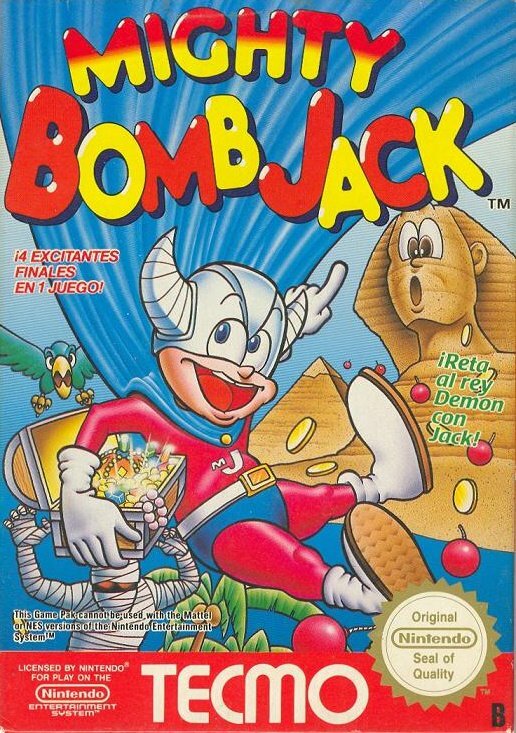 I remember the ads for this game when it was originally released that were in NintendoPower or Fun Club News (can't remember) featured a very real rather large accountant looking guy wearing that blue and red leotard and holding a bomb. Rather disturbing! F*CK YOU, REVIEWER! THIS GAME IS AWESOME!